This comic references canon established in EGS:NP, and unlike Question Mark, that canon isn't particularly complicated. 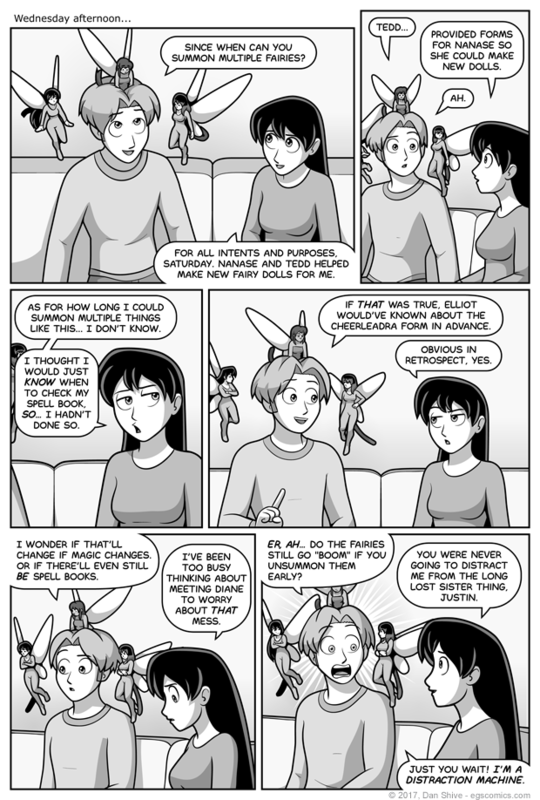 This comic pretty much covers everything one could need to know at the moment (except maybe why fairy doll Grace has a different outfit, but that's not exactly a game changing detail). If one wants to know the full story, here it is: Playing With Dolls. At the time of posting it, nothing in that storyline is spoilers, though I suppose this comic spoils some things for it? Granted, it was noted as being canon back in the last Q&A, so I suppose fair warning was had a while ago. If you're from the future and not done reading this main archives, pleast note that there are probably comics in later EGS:NP storylinees that have spoilers for later in this main section (though, again, Playing With Dolls is fine if you're already at this point here). For as complicated and big as this story arc has been, I've been making an effort to keep it focused and avoiding tangents. This has, unfortuately, meant a lack of certain characters not terribly central to its plot. In particular, Justin and Ashley have been absent. Both those two and Sarah are basically owed dedicated storylines after Sister 3 (I know Sarah's been in Sister 3, but she's got a not-date situation, darn it). Fontunately, this moment of Justin council counsel is Sister 3 relevant, SO HUZZAH!